Aaron Ninness has worked with New American Funding for the past three years as Branch Manager at the Greenwood Village, Colorado, location. His current role involves helping his team structure deals, mastering the details about the vast loan options offered, bringing in new business and closing loans. He spends majority of his time learning, so he can take that knowledge and empower his team to further drive their success. Aaron chose to join New American Funding because of how direct the company is and the phenomenal service it provides. 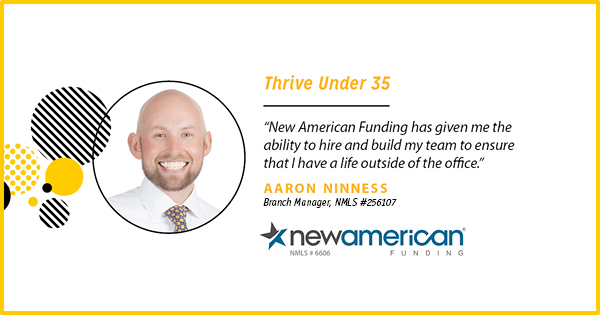 Aaron describes the culture at New American Funding as family oriented, fun, and with “an abundance mindset.” He enjoys the positive vibes and hopes to help make New American Funding the No. 1 mortgage lender in the nation someday. He has the vision to do so and believes he can make it happen one day.